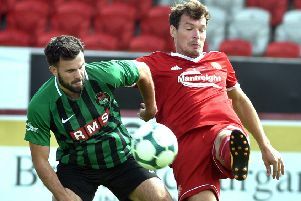 Cliftonville will be without Jason McGuinness for six weeks after the Irish Football Association’s Disciplinary Committee threw out a challenge from the North Belfast club. McGuinness was dismissed for a headbutt during their Danske Bank Premiership match on December 10 last year. A challenge was submitted by Cliftonville in which the club claimed the referee made an obvious error in dismissing McGuinness. McGuinness subsequently served an automatic one-match ban and was then suspended by the committee for a further six matches for violent conduct (headbutt). The Disciplinary Committee heard an appeal from Cliftonville against the six-match ban. They considered written and verbal submissions from both the club and the refereeing team. Video footage of the incident was also viewed several times. The committee was not satisfied that an obvious error had occurred and Cliftonville’s challenge was therefore refused and the sanction upheld. The six-match suspension imposed upon Jason McGuinness will begin on Monday 30 January. Meanwhile, the committee have also upheld a decision to fine Glenavon £350 for fielding an ineligible player on 26 December 2016. The breach related to the playing of suspended player David Elebert on Boxing Day against Portadown. The club was fined £350 by the Irish FA Disciplinary Committee and ordered to forfeit the match against Portadown by the score of 3-0. The Disciplinary Committee heard written and verbal evidence and submissions from both the club and the Association and found that, in accordance with Article 15.5 of the Disciplinary Code, ultimate responsibility for ensuring the eligibility of a player lies with the club and therefore the challenge was unsuccessful. Glenavon FC have a right of appeal under Article 14 of the Irish FA’s Articles of Association.